This post has 7,723 views. 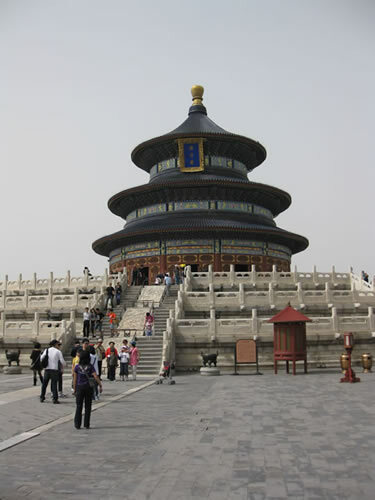 The Temple of Heaven (天坛) is a large park located in central Beijing. 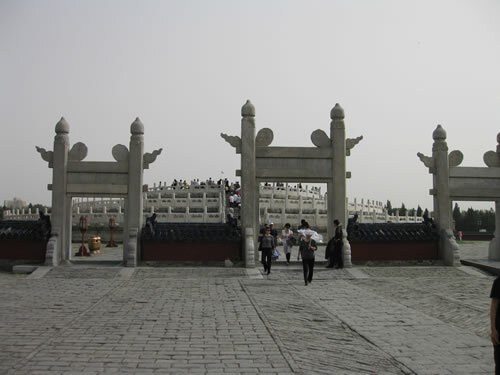 It contains a bunch of temples and buildings and was visited by the emperors from the Ming and Qing dynasties for prayers to heaven for good harvests. Unlike the Palace Museum or the Great Wall, the Temple of Heaven is not swarming with tourists, particularly in the wooded, green areas. 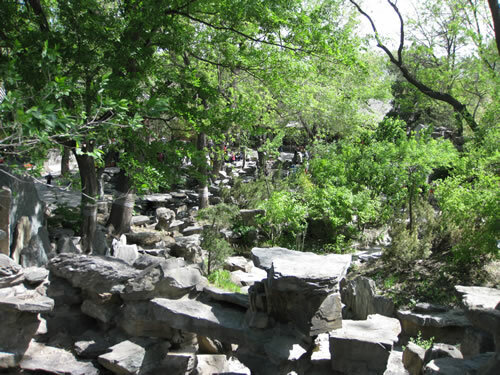 It is a refreshing patch of greenery in the otherwise dense and busy central area of Beijing. 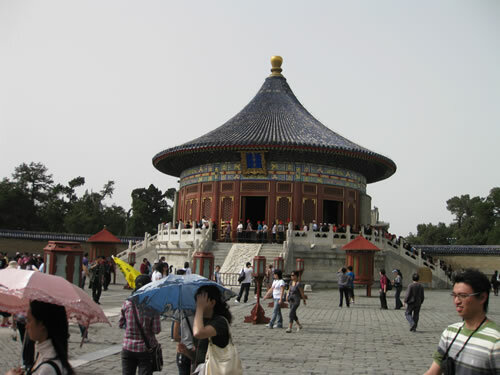 The Circular Mound Altar within the Temple of Heaven park. This was where the emperors prayed for good weather. The Imperial Vault inside the Temple of Heaven Park. 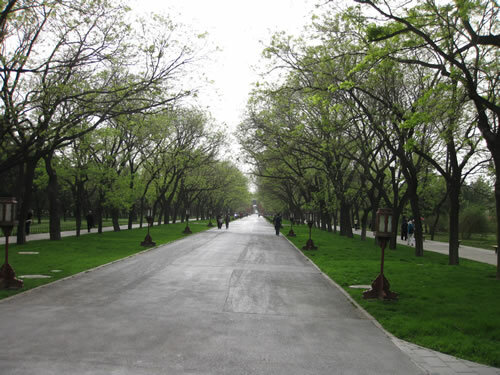 A quiet walkway inside the Temple of Heaven park. 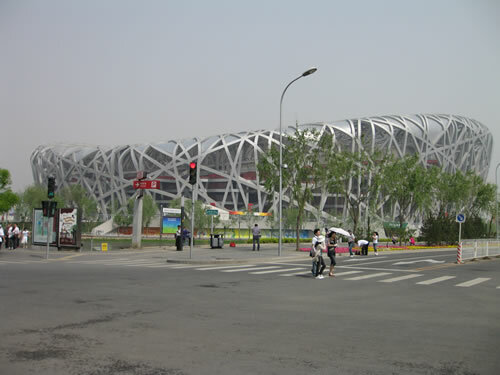 The National Stadium, aka Bird's Nest. The photo is blurry due to the smog. 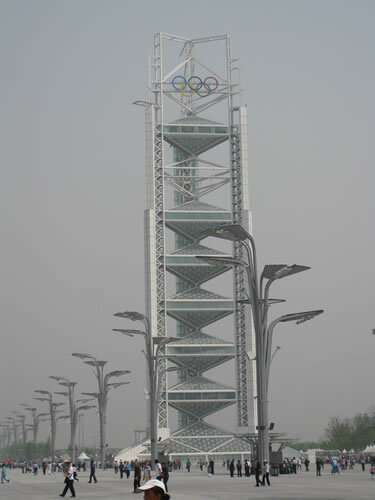 For the 2008 Summer Games, Beijing has erected a number of impressive looking athletic facilities at the site known as the Olympic Green (北京奧林匹克公園). The facilities at the Olympic park include the Beijing National Stadium (国家体育场, aka Bird’s Nest), the Beijing National Aquatic Center (国家游泳中心, aka the Water Cube), the National Indoor Stadium (国家体育馆), and the Ling Long Pagoda (玲珑塔) among others. 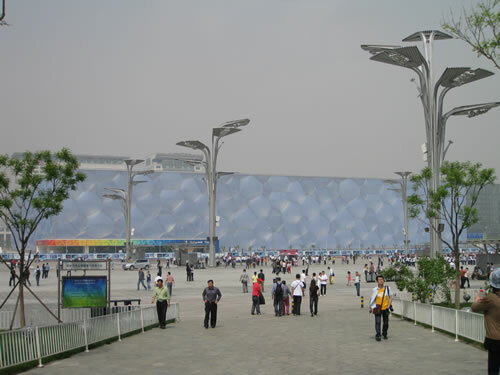 Unlike many other places in Beijing, admission into the Olympic Green is free, although you have to pay if you want to go into any of the facilities. The National Aquatic Centre, aka the Water Cube. As with all photos from that day, this photo was blurry because of the heavy smog. The Ling Long Pagoda in the Olympic Green. It served as a broadcast tower during the 2008 Olympics. 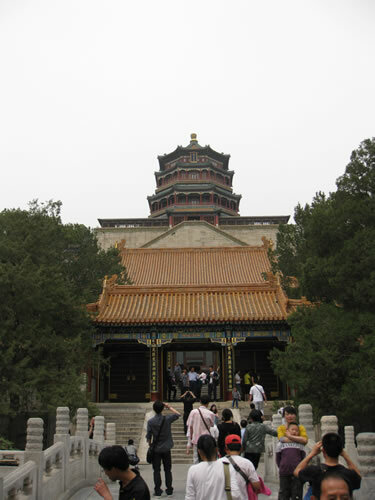 The Summer Palace (颐和园) is a massive palace and garden complex located in the northwest part of Beijing. 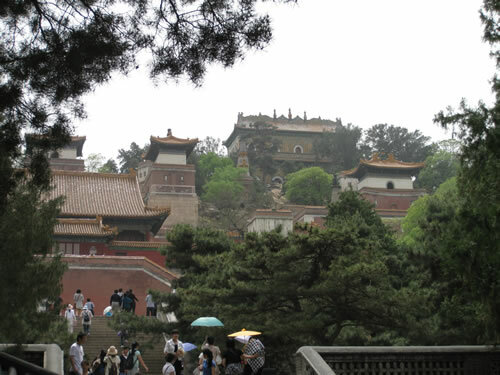 The Palace has had quite a history, having suffered major attacks during the Qing dynasty and rebuilt by the Empress Dowager Cixi who used the palace as a summer resort. 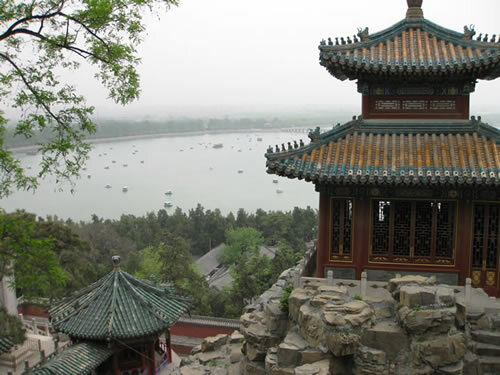 Major features of the Summer Palace include the 60m tall Longevity Hill (万寿山) and the Kumming Lake (昆明湖), the latter of which takes up 3/4 of the total area of the palace. It is a big complex with a lot of things to see. After half a day of walking, my family only managed two visit about half of the Summer Palace as we didn’t walk around Kunming Lake yet. By that time we were too tired and decided to leave the rest of the palace for another visit. 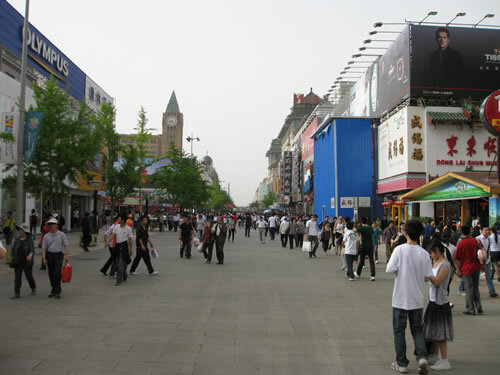 Wangfujing (王府井) is a famous shopping street in Beijing. Most of the street is off-limits to car are lined with restaurants and shops. There is also a snack street serving street food, ranging from normal items such as lamb kabobs to exotic items like fried scorpions and other insects. 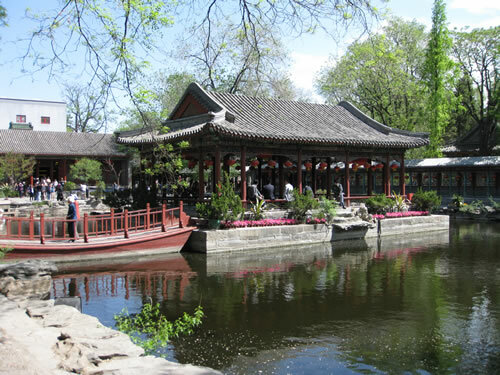 Prince Gong’s Mansion (恭王府) is a large mansion complex located in the western part of central Beijing. The mansion was originally built by He Shen, a corrupt minister from the Qing Dynasty. He Shen was eventually executed for his corruption and mansion was seized in 1799 and assigned to Prince Qing Jun. Finally in 1851 the mansion was assigned by Emperor Xianfeng to his brother Prince Gong, and this is how the mansion got its name. 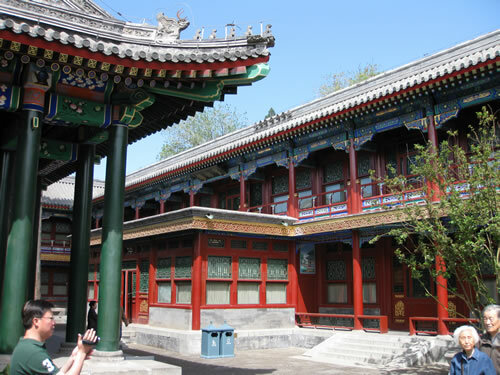 Prince Gong’s Mansion is located in an old part of the city and is not easy to drive to, and thus it is not as crowded as some of the more notable tourist sites. It is still a cool place to visit though and the garden within the mansion complex is beautiful and well maintained. The National Centre, aka the Egg. Beijing is supposedly short on water, and now we know where a lot of the water went. 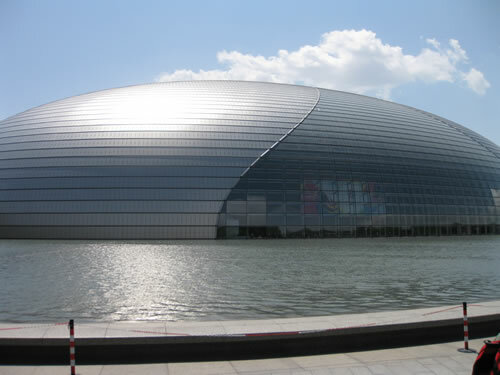 Also known as the Egg, the National Centre for the Performing Arts (国家大剧院), is a theatre located not far from Tiananmen Square. The theatre is distinguished by its glass dome structure and surrounding man-made lake. To access the theatre, patrons have to walk through a tunnel going underneath the lake and into the theatre.